The Member of Parliament for Gomoa Central Constituency in the Central Region, Hon. Naana Eyiah Quansah has assured her constituents that His Excellency Nana Addo Dankwa Akufo Addo led NPP government would continue to support vocational training to create jobs for the teeming youth. She has therefore stressed her readiness to support Persons or Groups of Persons in her constituency eager to go into apprenticeship to be self sufficient.
" With the support of my District Chief Executive, Hon. Benjamin Kojo Otoo, the Constituency Executives led by Alhaji Omar Appiah and Polling Station Executives, am ever prepared to support people who want to go into apprenticeship. I have been able to support many people in this direction thus hoping to reduce unemployment in the Gomoa Central constituency. Am also happy that the youth are eager to go into apprenticeship in dressmaking, tailoring, draughtsmanship, masonry, tiles laying others. This is good omen for the future of the constituency looking at the rate of unemployment. " 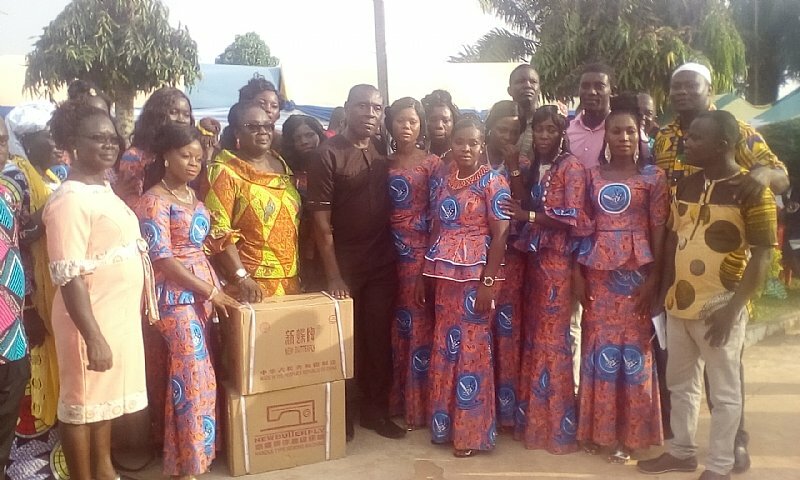 Hon Naana Eyiah Quansah stated these when she presented Sewing Machines and working tools to 12 graduands who had undergone a 3-Year apprenticeship course in dressmaking at Gomoa Aboso on the Gomoa Central District on Tuesday. The graduands were drawn from Aboso, Benso, Ekroful and Akropong. According to the Member of Parliament, the passing out of the graduands was an annual routine in which she gives out machines and working tools to persons or group of persons who had gone through apprenticeship in their various fields to enable them feed themselves and families as well.
" As graduands, I want to encourage you to put into practice whatever you were taught so that you can feed yourselves without being financial burden on your Parents. I know you are going to work extra hard to attract others who are also eager to go into apprenticeship thus supporting government's job creation agenda "
Hon. Naana Eyiah Quansah commended Parents for going through various forms of hardships to ensure that their wards attain vocational skills. The Gomoa Central District Chief Executive, Hon Benjamin Kojo Otoo disclosed that the Assembly was committed to vocational and technical training for the youth. While congratulating the graduands, the DCE said the Assembly had opened its doors and was ready to offer the needed support to the private sector. Hon Benjamin Kojo Otoo stressed the need for those in the private sector especially artisan to take advantage of Gomoa Central District Directorate of the Business Advisory Centre (BAC) to expand their Businesses. He noted that the Center under National Board for Small Scale Industries (NBSSI was established to sensitise the business community on productivity.
" As you go out there, I will urge you to inculcate the sense of modernization in your workplaces. We are in the global world and would like encourage you to fit into the global community. I expect you to be creative adding different styles to your products to attract customers and subsequent income "
Assembly Member for Ekroful Electoral Area, Hon. Ernest Quarm on behalf of the parents and graduands thanked Naana Eyiah Quansah and the DCE for their support praising them for seeking the well-being of the youth in the Gomoa District.